December's first Friday on Abbot Kinney is this Friday and The Abbot Kinney Merchants Committee bought up all the parking on both sides of the street from the city in order to prevent food trucks from parking. First Friday in Venice is where everyone wants to be, and the businesses on Abbot Kinney have taken a bold move. They have paid the Department of Transportation to post the street for “NO PARKING from 4 p.m. to 11:30 p.m.” with the full understanding that this means that passenger cars are included in the parking ban. The reason for this action is the excessive number of food trucks that show up. Valet parking services will be operating, including one at the corner of Navarre Court which is not restaurant-affiliated. First Friday began in 2007 when a group of merchants on Abbot Kinney banded together in an effort to promote business on the street. It was slow to start, but attendance gradually increased as more businesses joined in. For years, Abbot Kinney has hosted a holiday event with great success, and they were trying to expand on that concept. In June, 2009, there was a sudden increase in traffic, as word spread through social media that Abbot Kinney was ‘the place to be on First Fridays’. The increase in pedestrians caused some concern for public safety. The merchants, working with LAPD and the Fire Marshall, agreed to be more mindful of what they could do to stop contributing to sidewalk congestion. The crowds continued to flock to the street for subsequent First Fridays. The energy was exciting, and businesses flourished. In early 2009, food trucks began parking in a private lot on Abbot Kinney. These first few trucks were novel and well-received by patrons. By September 2009, what started out as a handful of food trucks quickly snowballed. Presently, anywhere between 40 and 50 trucks park along the full length of the Boulevard which has routinely created a public safety hazard. Pedestrians walk in the street because of the congestion on the sidewalks — congestion created by scores of people trying to navigate the narrow sidewalks made narrower by those waiting in line for the food trucks. Many merchants have reported that their businesses have been hurt by the presence of this unsustainably large number of food trucks, and the consequent problems associated with their presence. Many report that ‘scouts’ for the trucks actually park cars on the street early in the day to ensure that a truck will have a space for that evening – one food truck space is roughly equal to two mid-size cars. Trucks that park in front of businesses effectively shut those businesses down by blocking their signage and window displays. The cooking exhaust fills the stores. The associated trash and food waste litters the sidewalk. There is virtually no legislation in place that governs where and when the food trucks can do business. Most agree that having a few trucks present on First Friday could be an asset, but their attempts to negotiate moderation with the trucks have failed. The merchants of Abbot Kinney are working together to continue to provide a safe, festive, and welcoming atmosphere on First Fridays. To that end, they have scheduled their “Holiday Street Walk’ on Sunday, December 5th, from 3-8 p.m., with Santa and carolers convening at The Brig parking lot. SliceTruck has been to first Friday twice. Once in January, which was cool, and then in March when we were confronted by four different AK merchants in such a vicious manner, that we left within minutes of parking. Mainly because, for us, its not worth dealing with this type of thing for a couple bucks but also because we sincerely thought they might vandalize our truck. Personally I'm glad the AK merchant committee bought up all the spots. I live in Venice and enjoy walking over to Abbot Kinney on First Friday's to have dinner and take a stroll while stopping into a few shops. 50 food trucks on the street is an eye sore and makes walking down the sidewalk a bit annoying. I didn't hate the trucks being there but am looking forward to going this Friday. I think it will be nice to have no vehicle parking of any kind on the street. It will make the sidewalk larger and make it feel like a laid back community event. "one food truck space is roughly equal to two mid-size cars." -The average food truck is 22 ft long. A Ford Taurus is 16.9 ft long. "Trucks that park in front of businesses effectively shut those businesses down by blocking their signage and window displays." -There's thousands of people traveling down both sidewalks which are located between the street and the businesses. No one's business is being "effectively" shut down because a truck took a parking spot in front of their store. "The cooking exhaust fills the stores." -I've been to at least 9 first Fridays this year and have stopped into many stores that have a food truck in front of them and have never noticed this problem. "The associated trash and food waste litters the sidewalk." -Guns don't kill people, people kill people. The trucks aren't doing the littering, but I do know that the food trucks that go all chip in to pay $500 for a cleaning crew to walk around and clean up litter every first Friday in an effort to ease their relationships with the AK merchants. "There is virtually no legislation in place that governs where and when the food trucks can do business. Most agree that having a few trucks present on First Friday could be an asset, but their attempts to negotiate moderation with the trucks have failed." -To me this looks like an attempt to make food trucks look like some rogue stampede of lawless entities reeking havoc on Los Angeles. There are TONS of rules and regulations on us. Here they are. The truck's association has tried many times to talk with the AK Committee and they have had no interest in trying to work something out and actually have been a little sneaky and elusive in their actions. Here's a little insight to that. Whatever, I guess we're all just a bunch of liars who will do and say anything to get what we want and I should get used to it. I actually had to delete a few lies I wrote in this post before publishing it, and also I've actually only been to 6 First Friday's this year. And I only deleted one lie that was in the post before publishing it, not a few. It was a line where I said I even visit the merchant's on AK who chased us out in March. I definitely wouldn't do that. eFF them, as they say. It was a Weed shop, a salon and a sushi place. What?, didn't I say 4 merchants chased me out? I did. Turns out I've been caught in another lie, it was only 3. I had been to the sushi place before this happened, spent $250 on me and my date, it was great, expensive but good, a little more than I was planning to spend casually grabbing some sushi on an early in the week night, too expensive to tell you the truth, but.. Woody Harrelson and his girl where having dinner with Robert Downey Jr. and his girl in there at the same time and its a small place and I found this interesting. 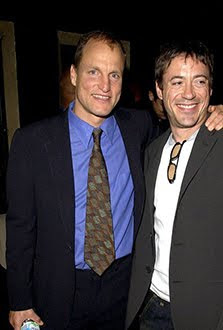 Bottom line is that I'm glad Woody Harrelson and Robert Downey Jr. are friends who hang out. As a side note, on Friday we'll be at The Hollywood Production lot for lunch from 11-3pm 1149 N. Gower St Los Angeles, CA 90038 and will be taking the night off and going to first Friday. I am really disappointed that there will be no food trucks. I was getting ready to go there to check it out, but if no trucks are going to be there, I think it will take away from the event. Maybe, we'll see. I'm going to take some pictures.